Give your furry friend ‘pride of place’ on the mantel with a personalized stocking for you to fill with their favorite treats and toys. 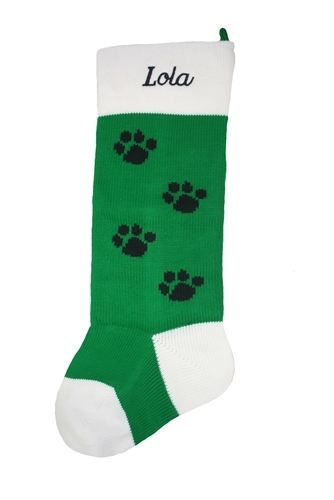 A playful paw print design is knit into this quality 100% acrylic stocking (24” long, 10” wide at foot). Custom embroidery makes this a fantastic personalized Christmas gift for your four legged friend or the cat or dog lover in your life.